"Warton Mill (of the type called peg and post) must claim our first attention. It was at one time a, most picturesque object, the admiration of artists and photographers, not because of the surrounding; scenery, but for its construction being entirely of timber framework, similar to these at Hambleton, Kirkham and Wavertree, near Liverpool. Most of you may remember having seen it standing as it still does just off the highway between Freckleton and Warton. It may not generally be known that up to the year 1771 it did duty for many years at Rufford. In that year it was removed, piecemeal across the River Ribble, and after its safe carriage as far as the Guide's House, at Warton, was carted and re-erected on its present site; so this year it will be 219 years old. It is called a peg-and-post mill, from the fact, as already stated, that the whole structure stands, and has always stood, on a peg or strong central shaft of wood driven into ground, on which the whole structure was turned round, so as to bring the sails facing the wind, by a, wheel running on the ground, worked by a long pole as a lever. This mill was purchased by Mr. A. Eccles about 19 years ago for the remainder of the lease, which expires December 12th, 1921, and then reverts to Mr. Clifton. Unfortunately it has been allowed for some years to run down to decay, although the owner has done many repairs. Now, however, it seems almost beyond mending. The, main working floor stands about six feet above the natural surface, of the ground. On this floor are the grinding stones. They are very large, about 5ft in diameter, and weigh 30cwt. 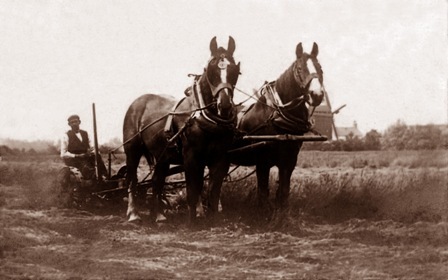 Ploughing at Warton in the early 1900s with the peg windmill in the distance (with thanks to Ted Lightbown for identifying this photo). A late tenant informs me that he could get through 15 loads of meal in a 12-hours day, provided there was a good wind blowing; during winter, with a strong sea breeze, he could grind 20 loads. If that be correct, we may conclude-the calling of a village miller must have, been a fairly busy and lucrative business.